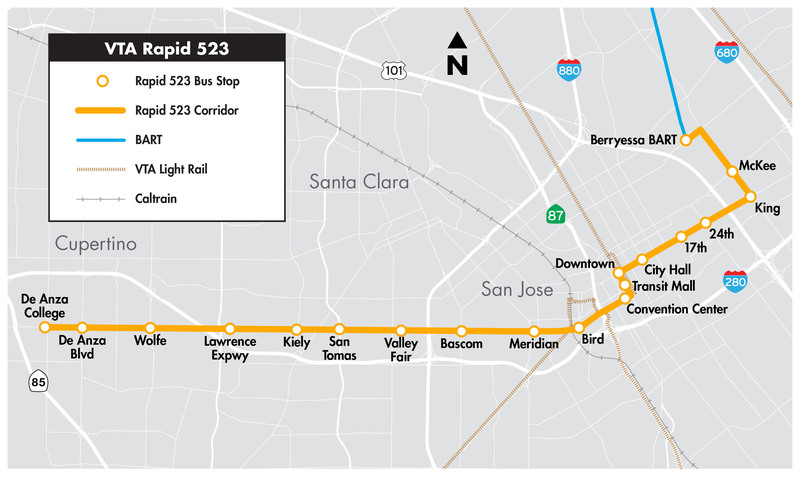 Based on ridership demand in the Stevens Creek Corridor, VTA will soon be implementing Rapid 523 service along the Stevens Creek Corridor. The Rapid 523 will replace the Limited 323 and will follow the example of VTA’s Rapid 522. The Rapid 523 project will improve travel time, enhance passenger waiting areas, and look at opportunities to encourage more walking and bicycling in the corridor. The project is focused on providing an enhanced service that will serve the Berryessa BART Station when it opens and, in coordination with the BART Transit Integration Plan, will create service between the new Berryessa BART station and Lockheed Martin Transit Center, by way of Santa Clara Street and Stevens Creek Boulevard. VTA also plans to work with cities of San Jose, Santa Clara and Cupertino to help achieve their goals of transforming the Stevens Creek corridor into a street with multiple safe transportation options for travelers, whether walking, biking, or connecting to transit. VTA will work in partnership with the cities to identify ways to improve streetscapes around stations, such as connecting sidewalks and bicycle lanes, adding landscaping and pedestrian lighting, and reducing the length of pedestrian crossings. The Rapid 523 project creates an opportunity for VTA to implement its Transit Passenger Environment Plan, providing high quality bus stop environments that enhance the transit experience and speed up boarding, which helps to reduce overall travel times. Currently VTA is implementing Transit Signal Priority on the Limited 323. The Rapid 523 planning effort will identify additional travel time improvements that can speed up transit in VTA’s second highest ridership corridor (23 & Limited 323). Construction on this project began in June 2017, with bus stations at McKee Road and Montgomery Ave. first to be prepared for enhancements. The total cost for the Rapid 523 project will not exceed the $7.7M budget. The funding for the project will come from the Measure A Transit Improvement Program. *Opening of the Berryessa BART station.